At the present time, music is one of the most important parts of our entertainment. As a result, we all are searching the source of music. Sometimes we get bored with our collection, and won’t download from the internet. For this reason, Radio can help us as a great source of music. We do not need to download every song to listen. Just need to open the apps and stream it. At the same time, you can enjoy talk shows, live music shows, and news. At this point, you need a perfect radio app. 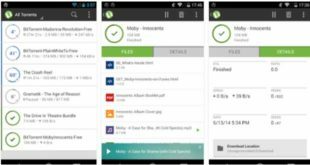 According to our expert, these are the 9 Best Radio Apps for Android Smartphones and Tablets. In the first place, TuneIn Radio is one of the Best Radio Apps for Android. TuneIn Radio is an editor choice app and from the top developer of Google Play Store. Listen to live radio stations, online radio, and podcasts. 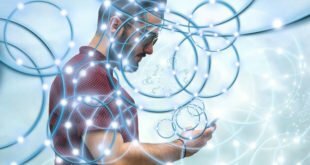 You can download millions of podcast to listen offline. Save your favorite stations on your profile. Live update and coverage of every NBA, NFL, MLB and NHL Matches. Listen everywhere, your home with Google Chromecast and also available Android gear wears too. iHeartRadio is a Free Radio Apps for Android lovers. iHeartRadio also comes from the top developer of Google Play Store. This one is very popular radio apps all over the world. You can listen more than thousands of radio station and podcast with this radio app. This is not only a radio app but also an unlimited collection of music. Great source of your local radio station all over the world. Stream popular sports channels like ESPN and Fox Sports. The popular podcast is also available too. At the same time, you can also stream free artist station. Simple Radio is one of the easiest ways to stream your favorite FM, AM, and online radio. 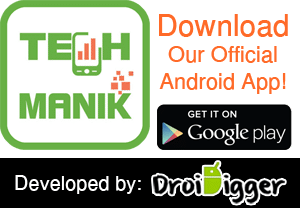 Get thousands of radio station with this app. First, you can easily use this app because simplicity is the main thought of this app. Truly, this one is going to add a great experience of searching. Search by genre or artist, you can get your result instantly. Simple Radio will provide you Sports Channel, Music channel, Live program, Talk shows and much more. Enjoy one of the simplest radio with the clean user interface. XiiaLive is an awesome Digital Radio App for Android. 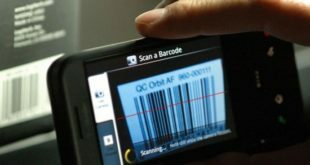 Mots of the features of this apps are fully digital. 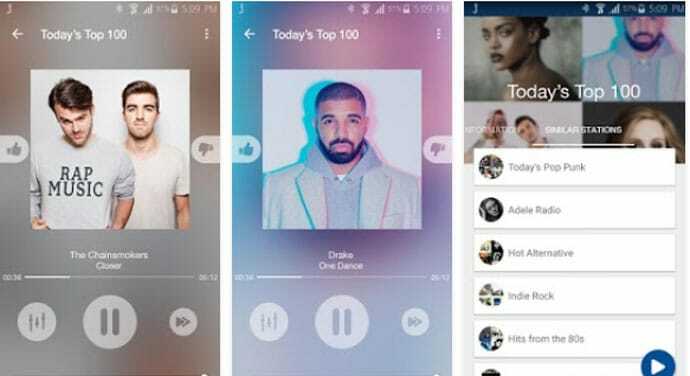 After having this amazing radio app, you can listen to more than 50000 radio station. In fact, you can search for any song, any artist, any show playing anywhere and play it. As well as, the user can play the favorite song in rewind. Favorite and History option to add or find favorite song and station. Scan feature to discover new station instantly. Sharing option for currently listening song or station to the social networking site. 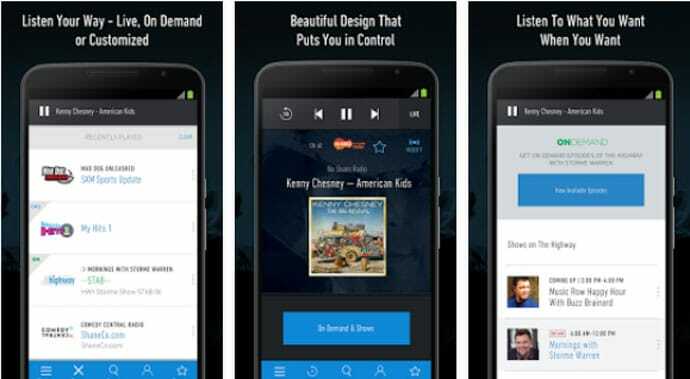 With tons of features, Jango Radio is one another Best Radio Apps for Android. like TuneIn and iHeartRadio, Jango Radio is also a popular radio app across the world. Jango allows you the unlimited listening in mobile, you can also listen on your desktop. For your favorite artist, you can create a custom station. To save your data, you can listen, high or medium or low quality. Save station to your device for later. Share your favorite station or currently playing station with your friends and family member. SiriusXM offers you AM and FM radio at the same time. It also provides more than 150 satellite radio station from all over the world. Custom and mix your favorite music and comedy channels. 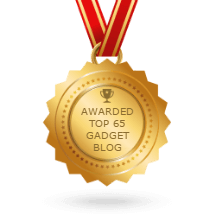 Store your favorite talk shows, news, or music shows. So that you can listen in offline mode at later. Easy and useful search system to find out channels. Social features to share with friends. Hear the best channels with SiriusXM. Stitcher Radio is all set to fulfill your demand with it hundreds of features. 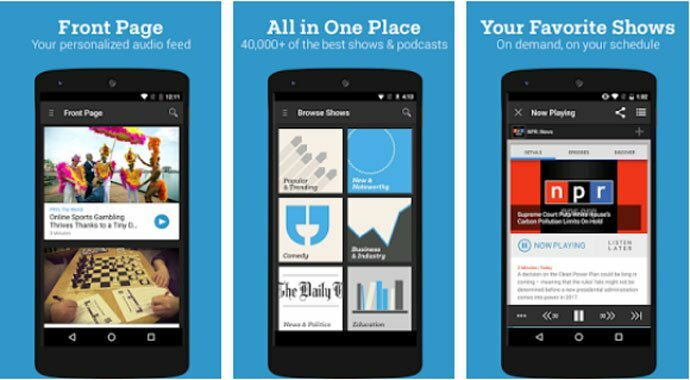 Stitcher Radio comes from the top developer of Google Play Store. Stitcher is a very advanced radio. Custom your favorite channel. Discover new shows recommended by other listeners. Get the latest episodes of your favorite shows as soon as they released it. At the same time, you can save your favorite shows listen to offline mode. Audio notification for biggest breaking news of the day. You can share your favorite shows too. Especially for those, who needs an online radio. Radio Player by Audials is one of the Best Android Radio App. Listen to unlimited radio stations for free. Simply enter your favorite artist or genre and find out your favorite stations. It has an alarm system to wake you up with your favorite radio stations. Snooze alarm is also available. The recording features for the record your favorite program to listen later. With the awesome radio enjoy more than 100000 podcasts too. myTuner Radio is one kind of Best Radio App, with tons of features. Tune more than 40000 radio stations. Stream all kind of channels like Sports channel, Music channel, Live channel, as well as the live program. Listen to the podcast and can play the radio in the background. Enjoy AM and FM radio at the same time from more than 200 countries. Add those channels to your favorite list which you listen frequently, and share with your friends too. 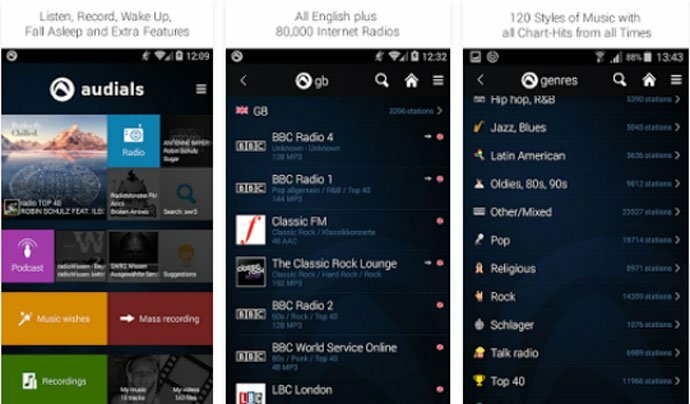 These were our 9 Best Radio Apps for Android Smartphone and Tablets. In fact, every single app is the best on their way. Choose your favorite one and get a great experience than before. Some of these apps are really good with their basic features, on the other hand, some these are best with their advanced features. Make your decision and download the best one. No doubt, you will enjoy it.